When it comes down to it, there are three major reasons we love airtight, well insulated homes with well designed HVAC systems: comfort, air quality, and efficiency. Any time a builder or contractor skimps on airtightness or hacks in an HVAC system, you’re going to be less comfortable, breathe dirtier air, and pay more for heating and cooling. Know what’s emblematic of those problems? A single central air return. Not only do central returns constitute less-than-ideal HVAC design – they can also increase the intensity of air leakage and create severe indoor air quality issues. So… yeah. We don’t like them. To understand why, let’s take a picnic to the beach. A sandy beach. On a warm, summer day. You arrive with a basket full of food, but by early afternoon you and your family have eaten everything. The basket is empty. All of a sudden, your kid dumps a bunch of sand in the picnic basket. Oops! It’s a good thing you brought along your… shop vac! Now you can vacuum up the sand in a flash and the basket will be clean. Note: We know that nobody brings a vacuum cleaner to the beach, but please play along for our sake. There’s a point. After vacuuming up all the visible sand, you notice that the shop vac is sucking up even more sand. It’s pulling sand from the beach itself through the basket weavings. As a result, the basket is actually getting dirtier. At some point, it dawns on you that vacuuming sand out of a basket on the beach is silly. You pick up the basket and dump out the sand. Having one central air return dirties up your house in much the same way. Except you can’t pick your house up, turn it upside down, and shake out the yuck. When bedroom doors are closed, the return is starved for air. Instead of bringing in air from the home, it creates a negative pressure environment where clean, conditioned air is replaced by unfiltered, outdoor air. Or attic air. In other words, there’s a lot of air infiltration. Bedrooms only get supply air, putting them under substantial positive pressure when doors are closed. Instead of returning to the home’s HVAC system, the conditioned air leaks from the bedroom to the outdoors. Dirtier air. Energy loss. More HVAC wear and tear. Higher utility bills. Less comfort. That big central air return could be causing all sorts of problems! Though rare, negative pressure in an upstairs hallway can be so severe that the central return starts pulling CO from gas appliances. When you don’t have an equal pressure balance across the house – and you have combustion appliances inside an unvented, conditioned space – this scenario is possible. Just like the vacuum cleaner that made the basket dirty, your central return could be bringing in lots of outdoor air (and outdoor humidity in summer!). At the same time, it could be causing energy loss in upstairs bedrooms – or any upstairs rooms that aren’t connected to an air return. And no, the door undercut usually isn’t a sufficient return air pathway. For a small bathroom or a closet, a door undercut might be sufficient. But for bedrooms, it often isn’t. The only way to find out whether an undercut allows enough air movement is to perform a pressure test for the individual room. Here’s the good news. This is a pretty easy problem to fix. Add a return to each bedroom that doesn’t have one. When this is possible, it’s usually the best option. If the return is located on the other side of a bedroom wall or you’re able to add ductwork, you should go this route. Install a transfer grille. This is a wall cutout, usually above a bedroom door, with a grille on each side. It opens an air pathway from the room, allowing more air to reach the central return. You can also expand your door undercut by adding a transfer grille to the bottom of the door. Install a jumper duct. This is kind of like a transfer grille except that it involves ductwork. Typically, we cut into your ceiling near the door, install a duct above the room, run it through your attic, and install the other end in the hallway near the central return. It’s called a jumper duct because it allows return air to “jump” from your room to the hall. 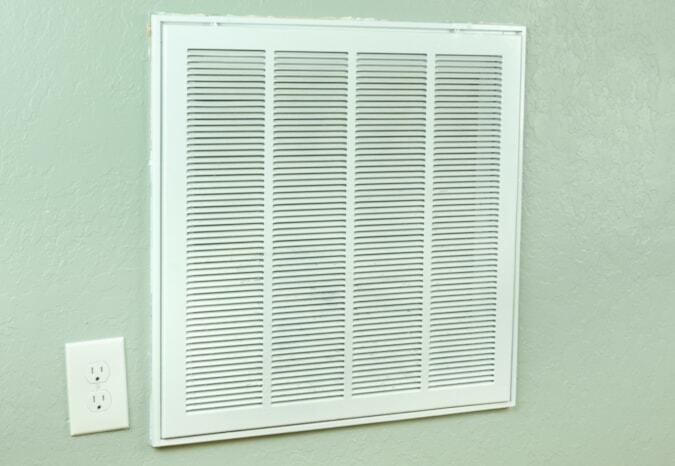 Compared to transfer grilles, jumper ducts are typically quieter. Transfer grilles cost less to install, though. If noise reduction is a chief concern, jumper ducts are your best bet. If lower cost trumps noise concerns, go with the transfer grille. After installing one of these fixes, your home should have a much better pressure balance than before. You’ll be more comfortable overall, enjoy better indoor air quality, and reduce your energy consumption – all from just helping move some air around. I’ve got a single central return. What’s my next move? It depends. If you never close your bedroom doors or you’re fine with leaving them cracked open all the time, you might not need to do anything. Central returns generally cause problems when bedroom doors are closed, not when they’re open. However, if you do like to close the bedroom door, you should be concerned about the central return. A home performance professional can test your home’s pressure balance to see whether adjustments are needed. And if you’ve got gas appliances inside your home, you should request a combustion safety test, too. When your home has this issue – and it’s super common – there’s almost always a straightforward solution. More often than not, the simple installation of additional returns, transfer grilles, or jumper ducts can solve the problem.